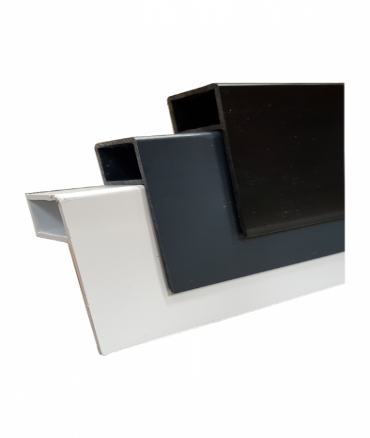 Here we have the high quality Permaroof UK UPVC Edge Trim in black, which can be used with most flat roof membranes. It’s designed with its own water-check kerb to be used around the perimeter of a flat roof to direct water towards the gutter edge. Permaroof Bond & Seal or Permaroof Closed Cell Foam Tape must be used to form a seal between the Trim and the EPDM (available on our website). Polypins are used to fix the trim into the Fascia Board. Corner pieces and End caps are used to finish any open edges. These are injection moulded using state of the art manufacturing technology. Extruded using virgin plastic ensuring colour fast, non-brittle, identical profiles. Manufactured BSI Quality assured to 99.9% accuracy. We are the manufactures of the Permaroof Trim and we guarantee to beat any price on the internet.